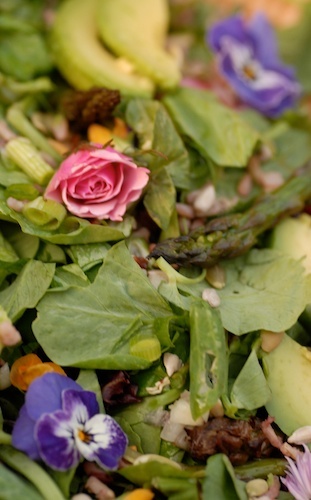 If you’re still looking for something to make on Mother’s Day, this recipe would suit an adventurous spouse who would like finding edible flowers in her Mother’s Day meal. My sweet husband made it for me last year and I shared the recipe with you then. We made it again last weekend. My husband shopped for the ingredients and roasted the asparagus, I made the dressing and assembled the salad. Last year my husband used some of the yellow flowers that you can find at farmer’s markets at this time of year, blooms from overwintering crucifers like broccoli or kale. This year he bought a package of edible flowers at our co-op, a mixture of rosebuds, calendula, nasturtium, and a few others. We ate them, even the rose, and they were pretty good, especially the tangy nasturtium flowers. I supplemented with a few violas, pansies, and chive flowers from our garden and sprinkled pepitas and sunflower seeds on top (in time for the second round of photos, anyway). The salad after I remembered to sprinkle the sunflower seeds and pepitas on top. 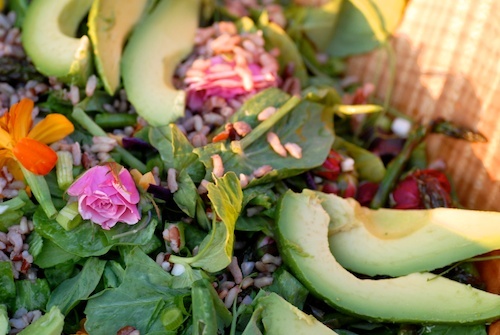 Mother’s Day Picnic Salad with Pea Shoots and Grilled Asparagus A spring picnic salad for Mother's Day or another special occasion featuring greens, grilled asparagus, a blend of whole grain rice, sunflower seeds and pine nuts, and sliced avocado. Spring Salad with Fava Beans, Asparagus, Chive and Viola Flowers A fresh salad with spring ingredients: violas, chives, asparagus, fava beans, plus yellow cherry tomatoes. Crab Louie A modern tweak of the old-school classic Crab Louie salad. 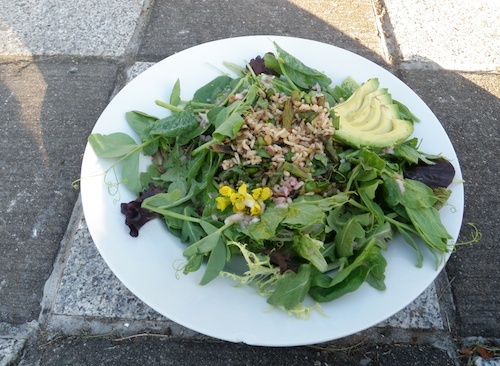 Salad with Toasted Sunflower Seeds, Avocado, and Cotswold Double Gloucester… An easy salad making use of my new find, Cotswold Double Gloucester cheese, plus avocados and toasted sunflower seeds. I think the only flower I have even eaten is lavender, but this does look really good! That’s almost the opposite of me, I rarely use lavender in food despite having a lot of it in the garden. I’ve come to realize it can be good in the right recipe, but using too much and getting a ‘soapy’ flavor turned me off to it for a long while. Thanks Kiran! Yes, I remember your pistachio rose muffins for Valentine’s Day, they looked exotic and tempting. Thank you Hazel! And thank you for stopping by my blog and commenting! What a beautiful salad! Any mother would feel special to be the recipient of such a special meal. And your husband is wonderful too, for having made it for you. Thanks, Mireya! I definitely do appreciate my husband making it for me. This year I asked for crepes and he made me a wonderful mid-afternoon meal of various kinds of gluten-free and regular crepes: mushroom/onion, strawberry, blueberry, raspberry. I have pictures, don’t know whether I will get them up on the blog! Your pictures are so pretty! I’ve tried Lavender chocolate and even a local Lavender coffee, but I haven’t tried any other edible flowers. Just in case you’re wondering…the Lavender coffee? Not so good. Lol! Thanks, Tempie! Lavender in food is a tricky one, isn’t it? Such a strong taste. The pansies and rosebuds are very neutral in flavor. 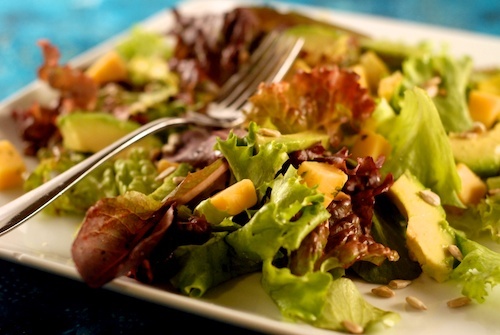 Mothers Day has come and gone, but this salad will be perfect for ANY spring/summer time dinner!! This looks so delicious! Thanks, Brittany! Yes, this ought to be good for as long as asparagus is in season. That would be nice! Along with some chocolate, of course :). It was sure full of spring colors! Oh so beautiful! I love edible flowers, both for their flavor and their looks. Nothing else turns a plain meal or dessert into something special more easily. Plus, their ephemeral nature makes them even more treasured. I feel the same way! Some day I’m going to learn how to make candied flowers, too.